L. arboricola is an rare epiphytic lily species in that it was found growing in the mosses on trees. It's name means "Tree Dweller". First described by Kingdom-Ward, along with his wife in 1953, in 'The Triangle' near Sumprabum in NE Burma, which is now Myanmar. Specimens collected there reportedly flowered once in Great Britain and then were lost to cultivation. In nature explorers have not been able to re-locate this rare lily. In his book 'Growing Lilies', Derek Fox said that after this species was lost in cultivation, enthusiasm faded quickly as there was no chance to make a second collectdion from the wild. As such, it became a "rare piece of botanical history". 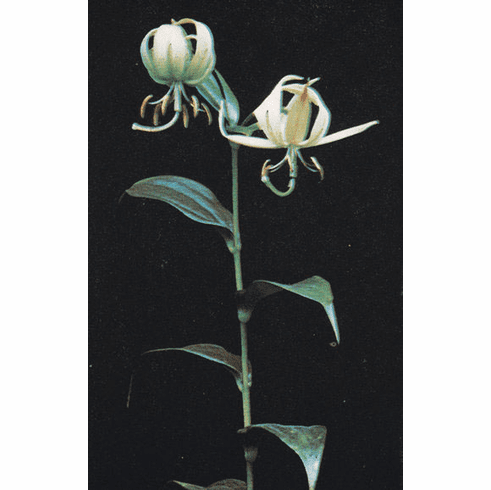 Our photo example is from the book 'The lily species and their bulbs' by Pontus Wellsten and comes from the 1957 RHS lily year book. Pontus commented this is the only known color photo of this species.